Welcome to Solo Motor Parts department. Solo Engines are made in Germany by SOLO Kleinmotoren GmbH, Postfach 600152, D 71050 Sindelfingen, Germany. 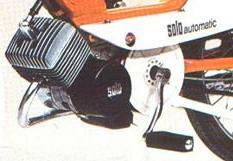 Solo made mostly small agricultural motors, chain saws, sprayers, etc. The name is from the revolutionary backpack portable sprayer for pesticides in 1951. The “Solo” could be used by a single person for the first time, whereas in the past pesticide sprayers required a heavy stationary motor pump and several assistants to handle the long hose. See Odyssey, Solo for more. 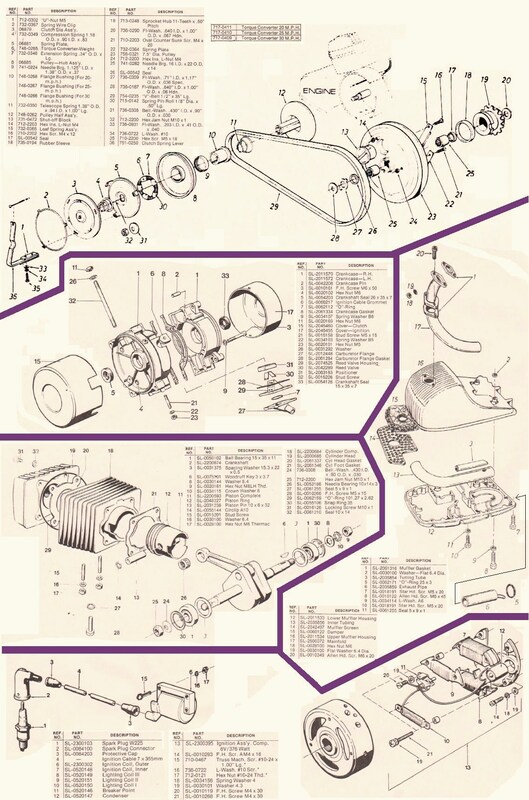 Solo/Odyssey Engine Service Manual, edited cover. 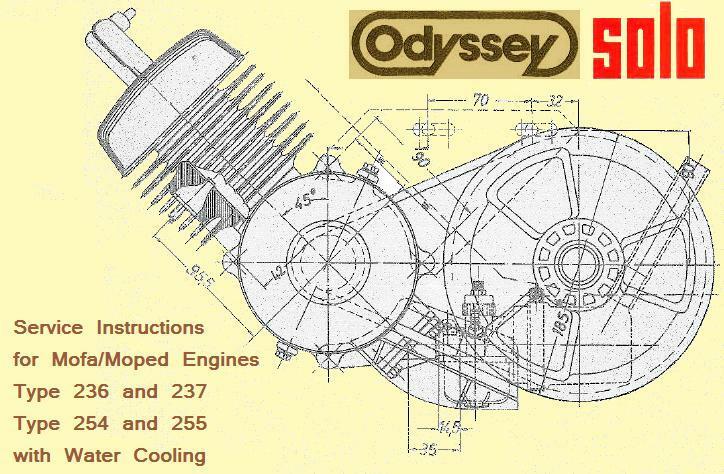 The specifications below are from the Odyssey Service Manual, 1977 edition, and from direct measurement. 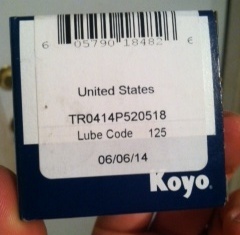 Clutch Seal: The pressure seal for the clutch side on the 254/255 is not just one seal, like normally. 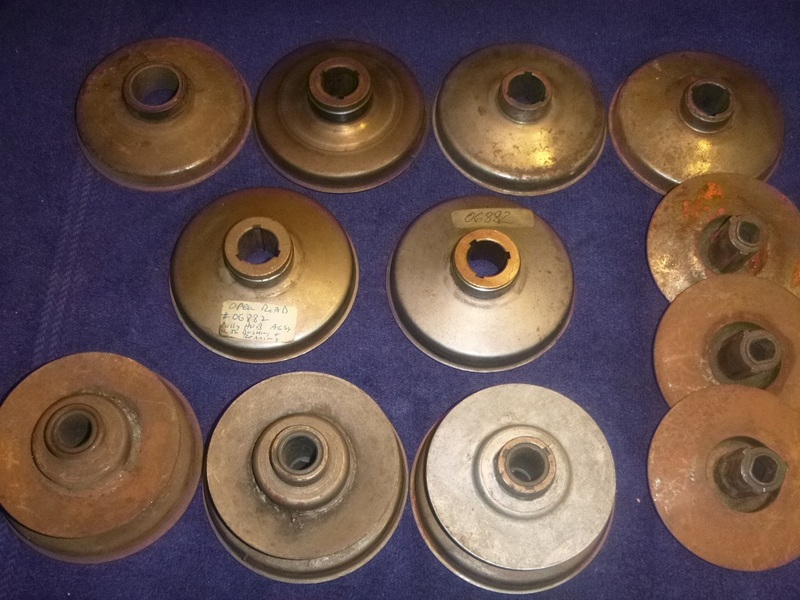 It is two seals, the outer one 26x35x7 seals case-to-clutch, and the inner one 15x21x3 seals clutch-to-shaft. 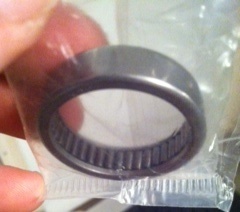 This is the Laura clutch seal/bearing design, similar to Batavus. 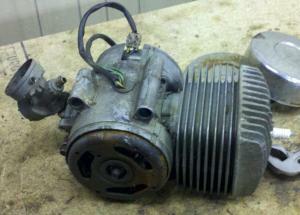 Instead of being separate in it’s own grease, the clutch needle bearing is bathed in the two stroke oil and gasoline. The benefit is it never needs to be greased. The drawback is the crankcase pressure has another place to possibly leak, both fresh air inwards, and fuel/air mist outwards. 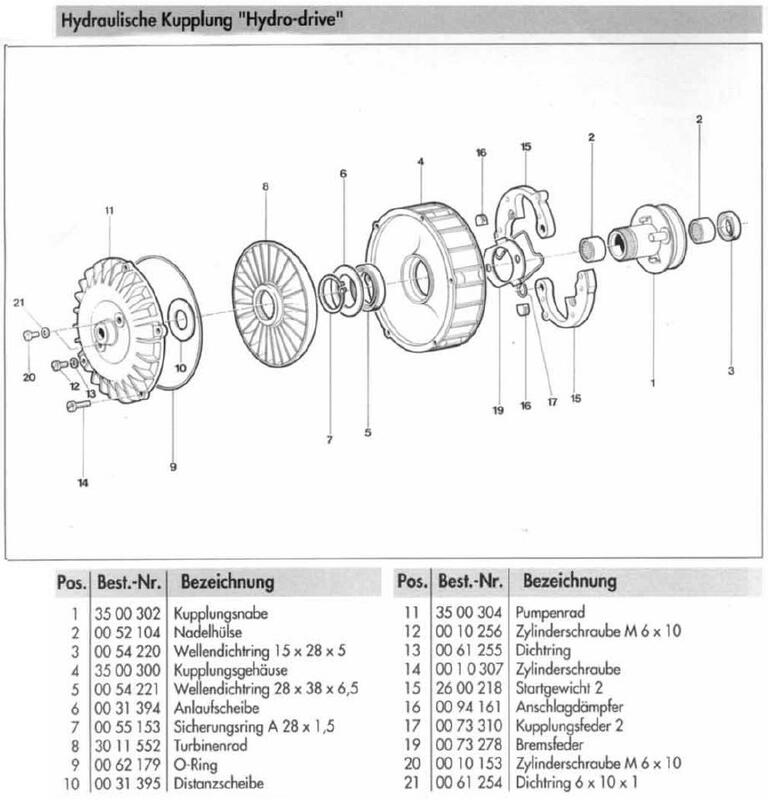 How to identify a 1 or 2 speed: There are two types of belt-drive transmissions, 1 speed and 2 speed. 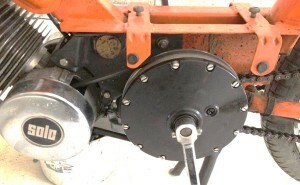 The one-speed (ein-gang) “regular” transmission has a solid rear pulley, with no screws around the edge. The two-speed (zwei-gang) transmission has a rear pulley with planetary gears and a second speed auto clutch inside, with 12 screws around the edge. The presence or absence of pulley screws is the best way to tell a 1-speed from a 2-speed, from a few yards away. 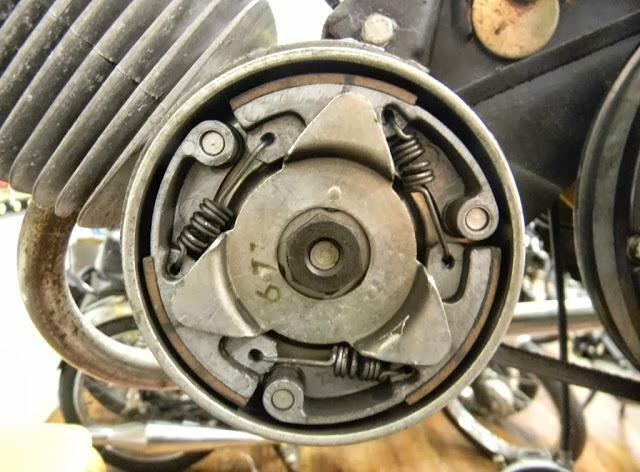 If the clutch cover is off, the presence or absence of the manual starting clutch lever is another way to tell. 1-speeds have it but 2-speeds do not. Solo 255 with Colombia “belt clutch”. The sides of the belt are the friction surface. No clutch shoes, no friction plate or disk. 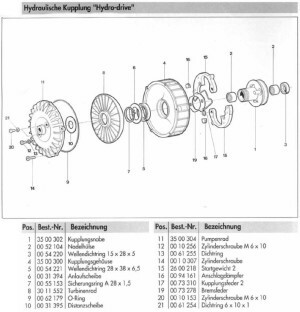 How the automatic clutch works: The engine is idling and the belt is stationary. The pulley sides are spinning, but the pulley center is not, because it is on a needle bearing. As the engine begins to rev up, the weights #6 fly out from centrifugal force. They force the outer pulley half #8 inward, causing the sides of the belt to rub on the spinning pulley sides. The bike begins to move forward. As the speed increases the weights fly out more and more. When the revs are high enough, the weights are fully out, and the belt is not slipping, or almost not slipping. When the bike slows down, the spring #7 pulls the weights back in, and the slipping process reverses. How the starter clutch works: A manual start lever on the handlebar pulls a cable, that pulls a start lever #36 against the clutch. It moves a plates #3 and #5 inward. That forces the outer pulley half #8 to rub hard against the belt. Then moving the bike forward, either by pushing or pedaling, causes the engine to turn over, and hopefully start up (if other things are working). 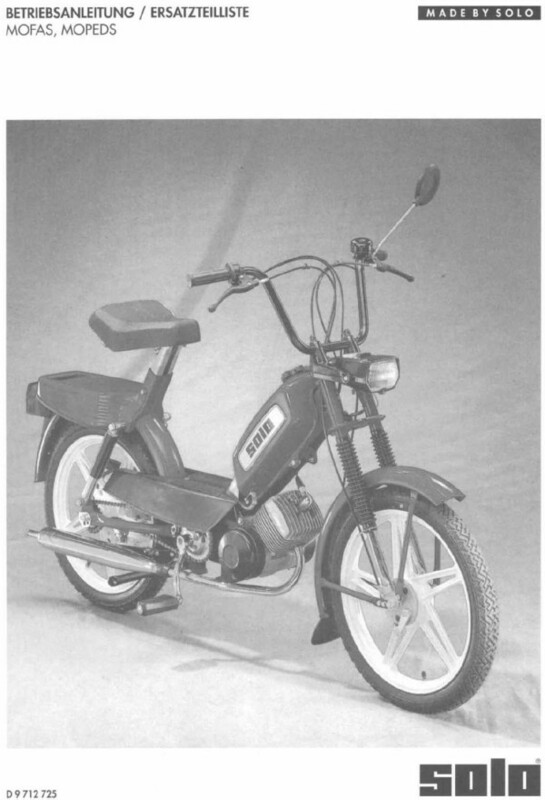 When the start lever is released, moving the bike forward has no effect on the engine. More clutch info: The Colombia “belt clutch” has a needle bearing in the front pulley that allows the belt to be stationary while the engine crankshaft is spinning at idle speeds. Those needle bearings often go out, and bind. Then the bike won’t stay idling unless the rear wheel is allowed to rotate at around 5 mph. The thin needle bearing needs to be greasy, inside, but the belt that goes around it needs to be not greasy. Another problem is high friction. As explained above, the sides of the belt are the friction surface. The trouble is, the design causes a lot of friction, so you have to push or pedal really hard. The excess friction is from the belt rubbing the pulley sides the wrong way. The belt only moves in a circular motion for half way around, then it moves across the pulley, not with it. Some people are not strong enough to get it started. Another problem is slippage. The sides of the belt always slip a little, but they slip a lot when greasy. Then you have to pull very hard with your left hand on the start lever. The hard squeeze required eventually leads to the starter pieces wearing out fast. Once that happens, some people end up wrapping a rope around the flywheel to use as a pull starter. De-greasing the belt, and applying sticky spray for squealing belts, should help it to not need such a strong squeeze on the hand lever. The 70’s bike, 20 years later. Modern gel seat, modern controls, no more chrome, aluminum wheels that resist bending. 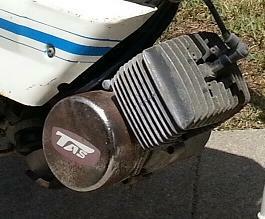 Same engine, frame, exhaust, fork, etc. 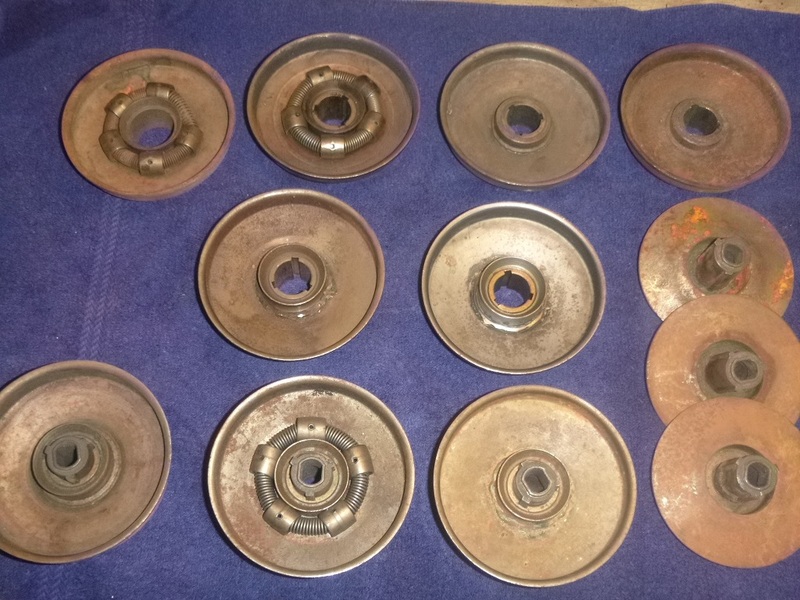 Same loose ball and cone wheel bearings. “Euro version” floor boards, lights, and bell. 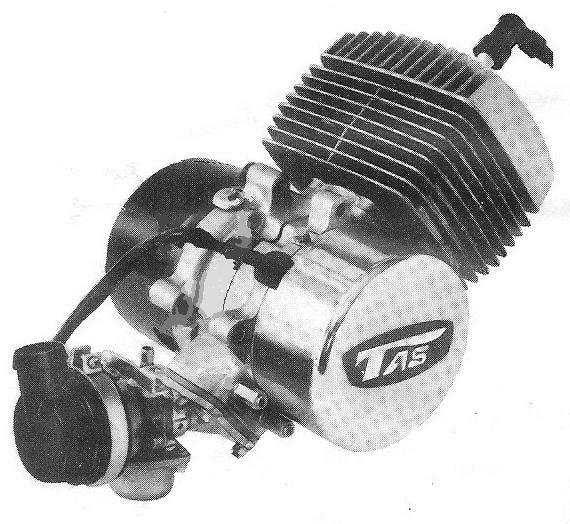 You are currently browsing the archives for the Solo Motor category.